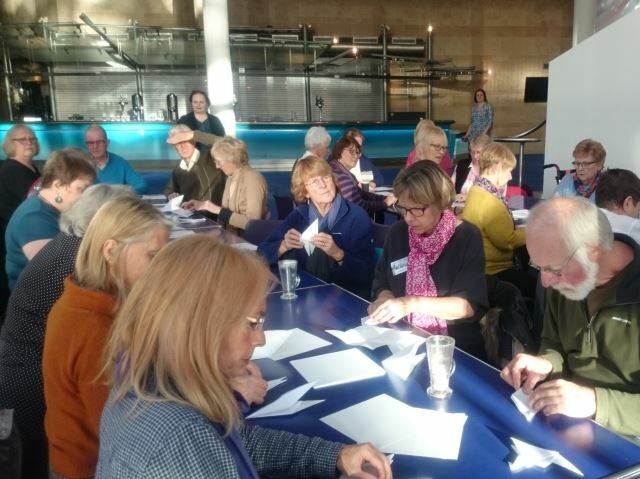 Last week artist Hannah Ayre and Bridgewater For All invited community groups from Greater Manchester to join them at The Bridgewater Hall, in church halls and community centres with the aim to create 1000 origami birds for Kathy Hinde’s ‘One Thousand Birds‘ installation which will include surround sound by sound artist Matthew Fairclough. A collection of 1000 origami cranes, according to an ancient Japanese legend, is said to grant a wish. The crane in Japan is one of the mystical or holy creatures and is said to live for a thousand years. This installation aims to bring people together and is inspired by the story of Sadako Sasaki. At the age of 12, Sadako Sasaki developed leukaemia as a result of radiation from the bombing of Hiroshima. She remembered the Japanese legend that anyone folding a thousand paper cranes is granted a wish. She attempted to fold 1000, as a wish to live. However, she only managed 644 before she died – her friends fnished the rest for her so she could be buried with 1000 birds. “My mission for the week was to create 1000 origami birds for an installation by Kathy Hinde and Matthew Fairclough. Thankfully I am not alone in the task. 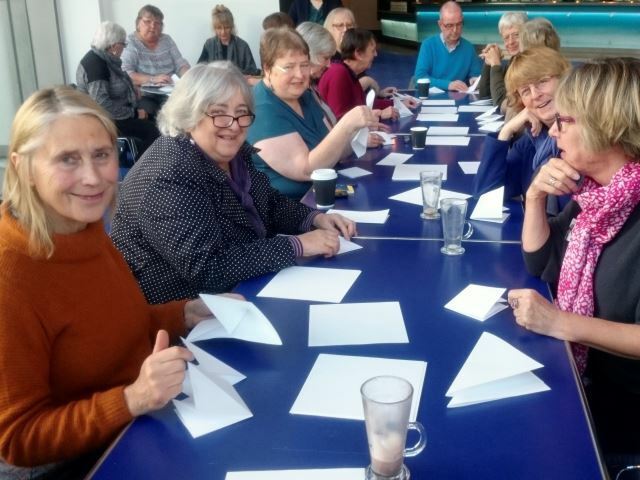 I’ve been meeting with groups from all over Greater Manchester, who have been helping out. If you haven’t made one before, the origami crane is a complex model involving umpteen folds. Participants have required patience, dexterity and precision. Many of the people I met were unsure of their ability and whether it was achievable for them. 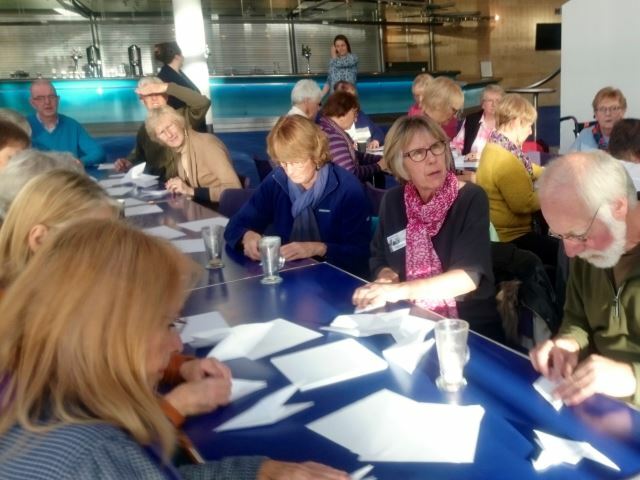 However, when their square sheets of paper transformed into a birds, there was an enormous sense of achievement all round,” said Hannah. 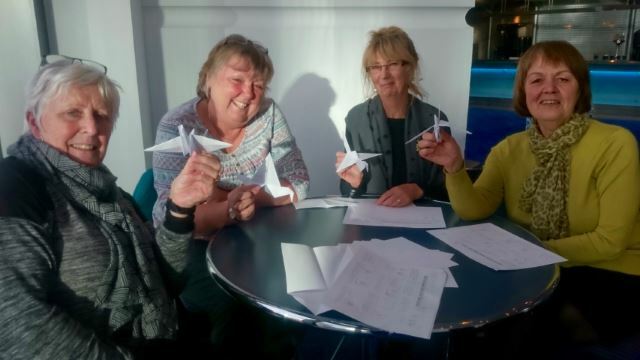 You can help us to complete our mission creating the ‘One Thousand Birds’ installation – Learn how to fold an origami crane by watching the video above and bring your completed bird to The Bridgewater Hall Box Office before Sunday 6th of December. Many thanks to everyone who has taken part, including adults and young people from the Keystones Centre, the Stoke Association in Duckinfield, the 6th Bury (Brandlesholme) Brownies, Chetham’s School of Music, Back on Track Confidence & Community Group, the Trafford Centre for Independent Living, Funky Fitness & Fun and The Bridgewater Hall Singers. Special thanks to those who caught the origami bug and have even taken paper to continue our mission at home. One Thousand Birds will be exhibited as part of Enlighten Manchester between 10-12th of December at The Bridgewater Hall – and then throughout December. Festival Entry is Free – Booking to Entry the Central Library.